About The Artist: As musicians, New Jersey natives Steve Piperno and Katie Burtnick are inspired by the positive influence music has on the emotional and intellectual development of young children. Mr. Steve is a singer, songwriter, producer, mixer and multiinstrumentalist who has toured the country with the rock band Green To Think. His music has been featured in a variety of mediums including television (HBO, MTV, and numerous cable television commercials), satellite radio, free radio, and independent films. Miss Katie is a classically trained vocalist who holds a Master’s degree in music education from Montclair State University and currently teaches elementary music at Rutherford Elementary School. Katie has also released several singles as a solo artist and briefly fronted the rock outfit Honeyface. 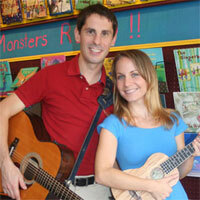 Mr. Steve & Miss Katie write, sing, produce, and record all their own music. They also play all of the instruments heard in their songs. Albums: Are you ready? Here we go!